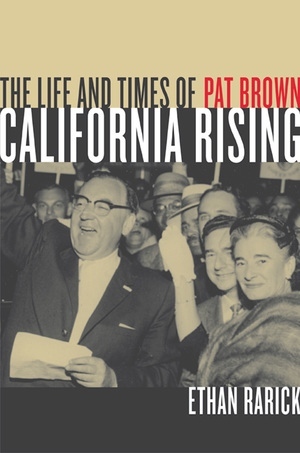 It is now commonplace to say that the future happens first in California, and this book, the first biography of legendary governor Edmund G. "Pat" Brown, tells the story of the pivotal era when that idea became a reality. Set against the riveting historical landscape of the late fifties and sixties, the book offers astute insights into history as well a fascinating glimpse of those who charted its course—including Ronald Reagan, John F. Kennedy, and the Brown family dynasty. Ethan Rarick mines an impressive array of untapped sources—such as Pat Brown's diary and love letters to his wife—to tell the unforgettable story of a true mover-and-shaker within his fascinating and turbulent political arena. California Rising illuminates a singular moment in time with surprising intimacy. John Kennedy laughs with Pat Brown. Richard Nixon offers the governor a schemer's deal. Lyndon Johnson sweet-talks the governor on the phone and then ridicules him behind his back. And as context for the human drama, key events of the era unfold in gripping prose. There is Brown's struggle with the fate of Caryl Chessman, the convicted kidnapper who gained international attention by writing best-selling books on death row. There is the tale of intrigue and politics surrounding the Free Speech Movement at the University of California, Berkeley, in 1964, and the violence and horror of the Watts Riots in 1965. Through the story of the life and times of Pat Brown, we witness an extraordinary period that changed the entire country's view of itself and its most famous state. As a journalist, Ethan Rarick covered politics in California and Oregon for 15 years before writing California Rising. His work has appeared in many publications, including the Los Angeles Times and the San Francisco Chronicle.